NextEra Energy Canada took down the nest Saturday in Haldimand County as horrified onlookers snapped photographs — the incident already has drawn outrage from environmentalists in Ontario and even in the United States. Onlookers claim no one with Ontario’s Natural Resources Ministry, which approved the nest removal, even bothered to show up to insure it was done properly. “This issue has people infuriated, and rightly so,” said Esther Wrightman, a wind farm opponent. His remarks and photos of the nest removal are on the website ontario-wind-resistance.org. The ministry approved the nest removal Dec. 31 without public input and posted notice of the removal one day before the nest was removed. On its environmental registry website, the ministry said its approval was intended to clear the way in Fisherville for the Summerhaven Wind Energy Centre, whose 56 turbines is expected to produce enough energy for about 32,000 homes. “Expanding clean and renewable sources of energy is key to the government’s plan to phase out coal-fired generation, mitigate climate change, create green jobs and support technological innovation in renewable energy,” the ministry wrote. “Bald eagles typically start to look for nests in early winter and have been known to use more than one nest. By removing the nest before Jan. 6, it is anticipated they will find another suitable nest location and will avoid disturbing them during their critical nesting period. Timing is critical as the eagles are not currently situated in the nest, however they have been seen perching in the area. 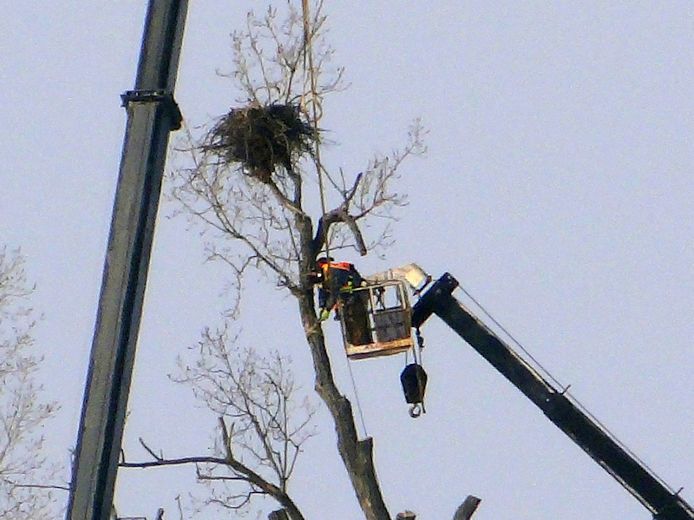 Removing the nest will reduce the risk of eagle mortality at the site. This wind project is being subsidized by taxpayers through Ontario’s feed-in-tariff program — a sore point with Conservative energy critic and Nipissing MPP Vic Fedeli. “How can anyone with an environmental conscience allow this to happen?” Fedeli asked in a media release.